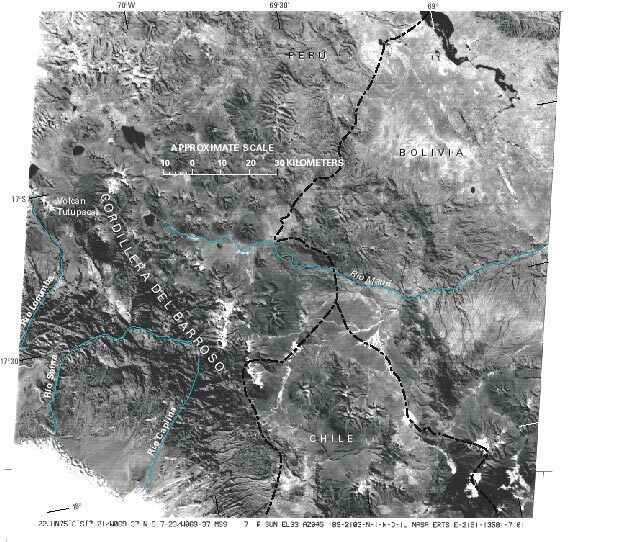 The Cordillera del Barroso, volcanic in origin, is in the Cordillera Occidental between lat 16°51' and 17°37'S. and long 69°45' and 70°30'W. It trends northwesterly for about 110 km. The total area covered by glaciers is estimated from Landsat images to be 20 km². Drainage is westward to the Pacific Ocean by Río Caplina, Río Sama, Río Locumba, and Río de Ilo and northeastward by Río Huenque into the Lago Titicaca basin. Volcán Tutupaca is the highest peak at 5,741 m asl. Next figure, a Landsat image, clearly shows the glaciers and volcanic landforms of the Cordillera del Barroso area. Section of an annotated Landsat image of the Cordillera del Barroso area. Both the glacierized area and the volcanic landforms are evident. Volcán Tutupaca is the highest peak in the region (5,741 m). Landsat 2 MSS image (2151-13581, band 7; 22 June 1975; Path 1, Row 72) from EROS Data Center, Sioux Falls, S. Dak.